It’s Saturday again. This week has absolutely flown by! All of a sudden, we’ve passed the middle of January and February is coming fast! 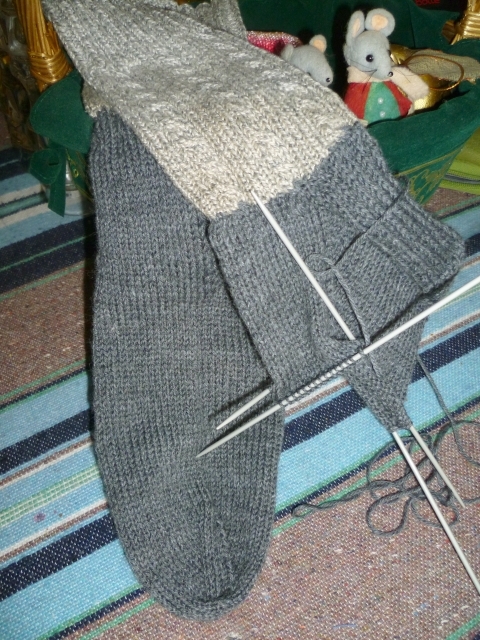 I wish I could say I’ve made good progress on John’s recycled socks, but some evenings were spent watching TV shows on the computer with John rather than knitting. I did spend a couple of evenings in the recliner, though, listening to an audio book (One Second After by William R. Forstchen… scary stuff, but sure makes you think!) and knitting the heel on the second sock while John did research on the computer. As you can see, there’s definitely been progress. I will probably have these finished this weekend. That’s my goal. I have a shawl to finish, after all. Speaking of the shawl, I think I will change the original “rules” of the giveaway just slightly. Until February 14, anyone that comments on any blog post will be entered into the draw unless you specifically tell me that you really don’t want to be included. So, if you would like an opportunity to receive the shawl, be sure to comment. This week, I also made the trek across the road from where I work to visit the quilt shop situated there. I picked up a little more fabric for my growing stash of craft fabric. I refuse to call it quilt fabric as I don’t, and won’t, quilt. I do, however, like making the little snappy bags (as seen in this post); they’re cute and fun to make. I’d like to make one with a zippered pocket on one side and another one to use as a case for my glasses. Wow, do they ever have some gorgeous fabrics! It’s always a difficult decision and I have to stop myself from buying more than I can use. Aren’t they gorgeous? All but the orange fabric also have metallic gold accents. 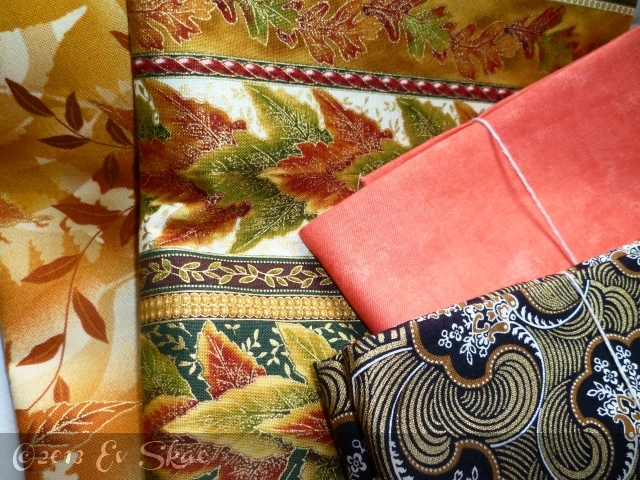 I’m so looking forward to creating something interesting with these fabrics. All I need now is some thread (I seem to be a little short on thread for some reason) and a couple of zippers. That means an outing today! The fabric is lovely! I love colourful fabrics, and often find myself tempted to buy some (okay, I’ll confess I have succumbed on more than one occasion), but I absolutely hate sewing. It’s a bad combination. I’m curious as to why you say you won’t ever quilt. ? LOL Kristie…. What will you do with the fabrics if you hate sewing?? I refuse to start quilting… official quilting, as in full size quilts and/or wall hangings… because the last thing I need is another hobby. Knowing myself as I do, I’ll jump in whole hog and spend way more money than I should. Besides, I don’t need any quilts and I don’t like quilted wall hangings. As far as I’m concerned, they serve no useful purpose. Same thing for quilted table runners, Christmas tree skirts.. etc. I do like making quilted pouches of various sizes because they always come in handy and make great little gifts, so that’s as far as I’ll go with quilting.